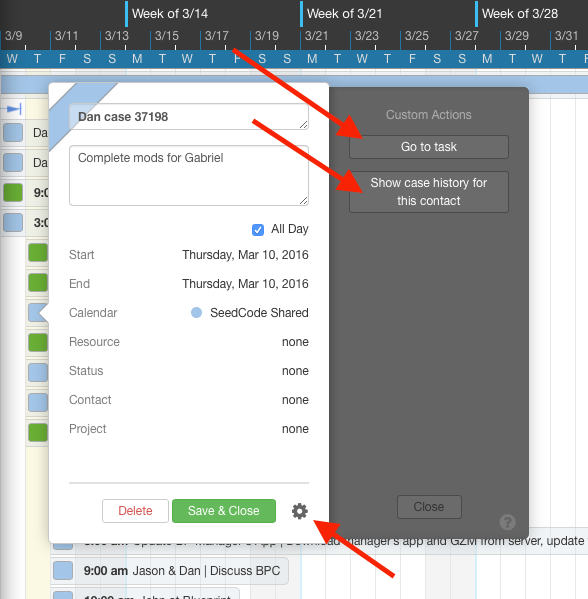 Custom button actions let you add your own buttons to the calendar. These buttons let you open other URLs or run scripts to go further when working with an event. Scroll down past the Source Settings and Field Mapping, past Event Actions, until you see "Custom Actions"
Click "Add New Custom Action" and give your action a name. Paste the code you'd like to execute where it says "URL or Function". This is obviously the interesting part--writing the action itself. Don't hesitate to get in touch and ask for help. Here are some additional examples you can use as the starting point for your own actions. 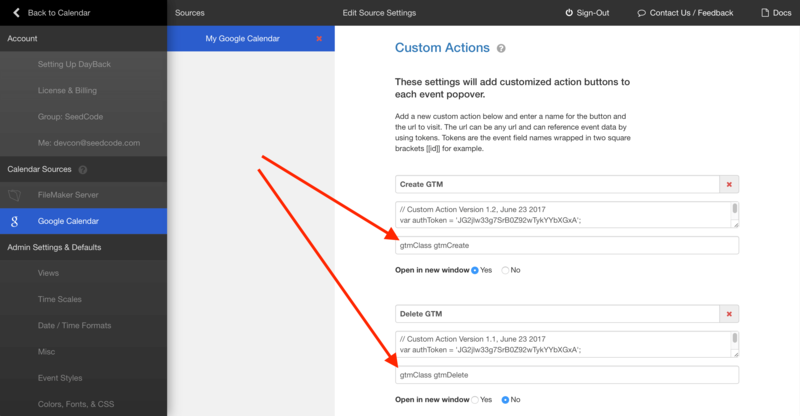 Movies and example code for creating, rescheduling, and starting GoToMeetings or Zoom Meetings from within your calendar: GTM Custom Actions, and Zoom Custom Actions. We use a wufoo form in this example since it's simple: field validation and emailing is all handled by wufoo so the event action we have to write is pretty simple. Here's a short video of this one in action. This custom function allows you to specify fields in which you would like to verify data entry. ValidateF ieldEntry.js If a specified field is left empty, a notice will pop-up notifying the user and allowing them to continue editing the event in the popover, or save the event with the empty fields. Click here for a video of it in action. emailSupport.js is a custom action that allows you to press a button in the event window and compose an email to "support" with the title, description, and a link to the event. emailSupportOnHold.js is an event action that triggers when the event is saved and it's status changed to your specified status ('On Hold' in this example). It will then compose an email notifying the event is in the specified status and containing the title, description, and a link to the event. • Calling a script in WebDirect will create a new database session that FileMaker Server treats as a new concurrent connection. • Before the script runs your solutions "OnFirstWindowOpen" script will run. • If you elect to run the action on the same window and you show the WebDirect toolbar, you'll see a second tool bar below the current one. ...if you're going all-in on WebDirect, we've developed some techniques to get around these limitations. They involve creating a session table so you can run scripts in the same window and session without the three limitations mentioned above. Please get in touch for more info. Icons. You can specify icons in CSS by selecting something from the FontAwesome icon set as you can see in the .btn::before example above where we chose the icon "\f00c". To find an icon, visit http://fontawesome.io/cheatsheet/ and select an icon (DayBack has access to *most* of these). You'll see the unicode for each icon to the right of it like "[". To use that icon in CSS, add a leading slash and just take the 4 digits starting with the "f" in every case. So in this case it would be "\f2bc".